Mass extinctions present both a mortal threat and opportunity. During these events, a great deal of all terrestrial and marine life perishes, but this also makes room for the next lineage to flourish in its stead. Like a bush fire, mass extinctions may be nature’s way of “cleansing” – a reboot for new experimentation to start fresh. Despite being extremely important (it doesn’t get more dramatic than “mass extinction”), the kill triggers that spur these events in motion are still poorly understood. But we’re learning. For instance, a team reports that ancient malformed plankton are a proxy for mass extinction events. Thijs Vandenbroucke, a researcher at the French CNRS and invited professor at University of Gent, Belgium, led the team which investigated the fossils. 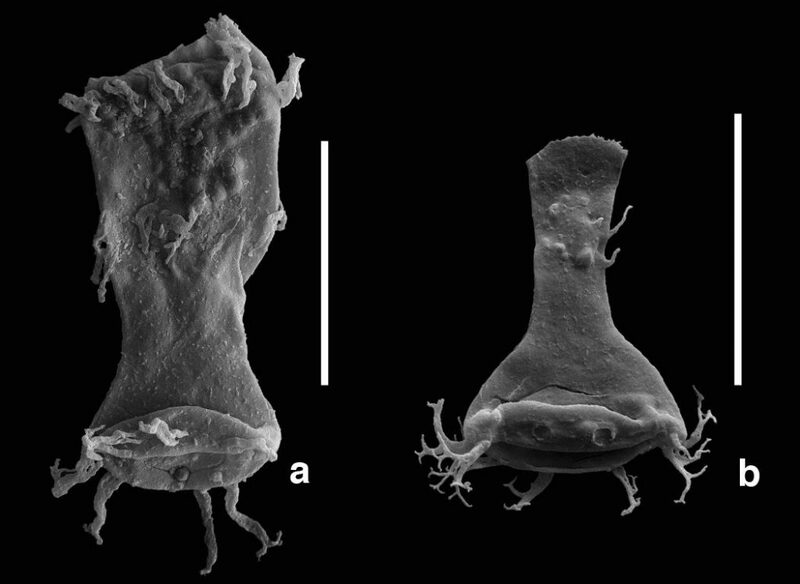 He and colleagues found that the malformed plankton from the Ordovician and Silurian periods (ca. 485 to 420 to million years ago) had high concentrations of lead, iron and arsenic. It’s well established that these heavy metals cause morphological deformities in modern organisms. The assumption is that the same holds true for these ancient organisms as well. Based on these findings, Vandenbroucke suggests that the spread of oxygen depletion and toxic metals are the likely cause of aquatic mass extinction events, rather than glacial episodes as previously suggested. The two are closely intertwined as reduction in ocean oxygenation drives a subsequent increase of these metals. “In normal, oxic conditions, such metals precipitate and remain sequestered in marine sediments,” Vandenbroucke told me in an e-mail. “We think these are significant factors during the event we studied. In addition, we also observe strikingly similar patterns (i.e. 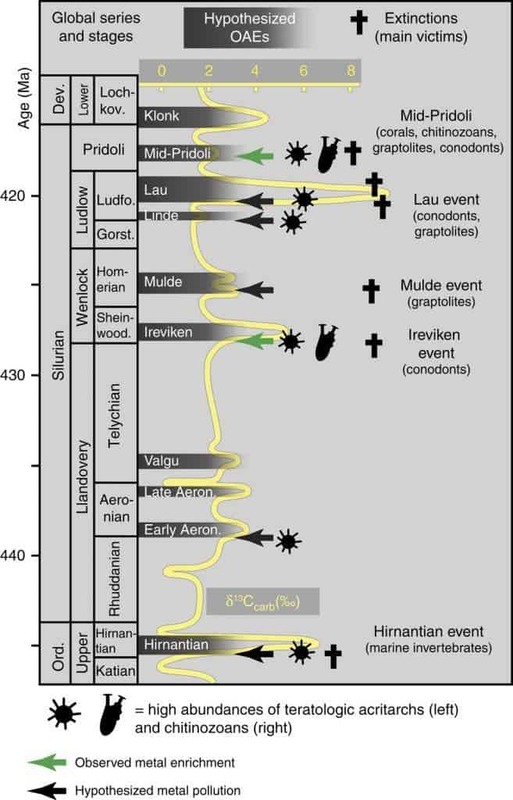 coinciding carbon-isotope excursions, increased malformation, and extinction events) for many of the other Ordovician-Silurian events, including during the Hirnantian, a major mass extinction that eradicated up to 85% of marine species. This suggests that anoxia and metal enrichment may be a contributor to all of these events. Based on the new insights gleaned from the pilot study we now published, we are currently investigating several of these events, in order to test our hypotheses,” Vandenbroucke said. The high levels of metals suggest changes in the ocean chemistry and the spreading anoxia may have been a contributing kill-mechanism during these early extinction events. This would make any fossilized malformed plankton extremely useful as a forensic tool – a biological indicator of periods of low oxygen levels. Findings modern day malformed plankton would also be a cause of alarm, one that should be duly noted – and that’s an understatement. Charles Lyell, a towering figure in the early development of the geologic sciences, suggested that “the present is the key to the past.” Flipping Lyell’s axiom to “the past is key to understanding our future” should always be done with caution – in particular when comparing the modern environment with something as old and different as the Ordovician-Silurian world. The megafauna extinctions of today are not a consequence of marine events but many parts of the marine food web are directly affected by the processes we describe. Our study, for example, might help highlight processes and hidden consequences, caused by fluxes of anthropogenic elements to the world’s oceans, that need to be considered when studying the ever-increasing problem of marine eutrophication and anoxia in some coastal areas,” Vandenbroucke said.